Many people jog daily for 15 minutes in the morning or in the evening, and still get no visible results. Why? You need to jog according to a specific method to lose weight. Running to loose weight is a very efficient method, since the load is evenly distributed to all the muscles, while rapid breathing and heartbeat activate the metabolism and burning of fat. In addition, running allows you to make your leg muscles more prominent and the body more graceful without exceedingly pumping of the individual muscle groups. However many jog daily for 15 minutes in the morning or in the evening, and still get no visible results. Why? You need to jog according to a specific method to lose weight. Jogging is healthy because it strengthens all the muscles of the body as a whole. It saturates your blood with oxygen, increases the life volume of the lung tissue, strengthens the heart muscle and blood vessels, makes your bones stronger and sturdier. Why jogging people don’t loose weight? Many put on the uniform and start jogging desiring to lose weight, but do so to no avail. If you jog every day for about 20 minutes it is impossible to lose weight due to specifics of the human physiology. However, not many people know about it and jogging for loosing weight quickly disappoint them and is quit. When jogging, i.e. running gently at low speed, the energy for muscles comes from the spare substance in your liver – glycogen (this is sugar stored in your liver to be used at stress.) It is enough on average for 30-40 minutes of active exercising and muscles recharge. If your jog was short, the body uses up part of the glycogen and replenish its stocks at the first meal. That’s why it simply does not get as far as burning fat as an energy source and you do not loose weight. So how to properly jog to lose weight? Usually the body switches to fat as the energy source when the blood flow and oxygen concentration increases in the area of the body fat deposits. You can understand it happening when you begin to feel tired and start breathing heavily. Therefore, to actively burn fat while running, you need to jog for at least 50 minutes, preferably for an hour. Then metabolism would switch to actively burning fat. However jogging for more than 1 hour 15 minutes is also not advisable: fats are broken down slowly, so metabolism starts to take the missing energy from protein meaning you would loose muscles. If you have no spare time for jogging and burning fat, but really want to lose weight, there is an option of the interval running. This type of running would not suit you if you smoke or have problems with heart and blood vessels. Lungs and blood circulatory system experience an enormous load during interval running, but the results are worth it. An interval training is the type of running at maximum load with periods of rest. Usually it is done the following way: the first hundred meters you run with active steps, flexing muscles, ligaments and increasing blood flow to them. The next hundred meters you must be jogging, adjusting your breathing, and the following 100 meters you sprint to the maximum possible speed and with full gear, then go back to jogging and rest restoring breathing. Then the cycle repeats. 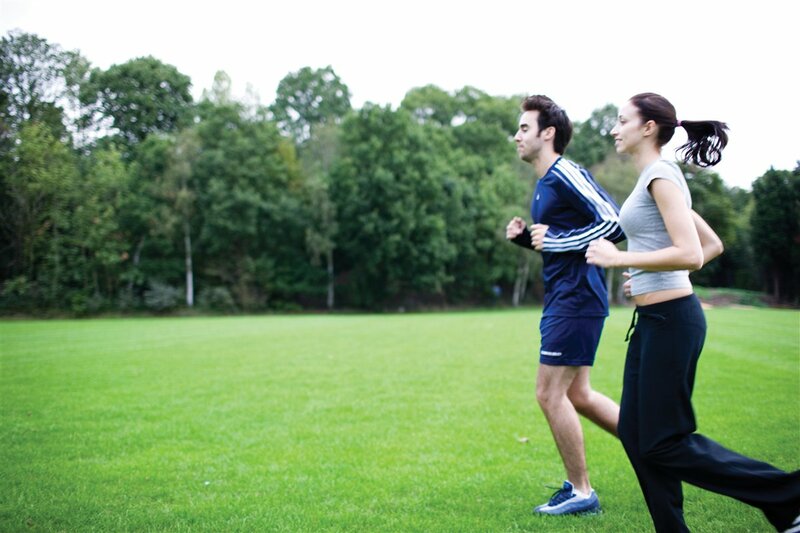 During the interval run specific physiological processes go on in the human body. A hundred-meter sprint race burns a tremendous amount of calories, so this distance run is powered by broken down glycogen from the liver. Then, when you switch to walking, the liver tries to replenish glycogen stores by splitting fats and readily available carbohydrates meaning you loose fat. In addition, sprint activates blood flow to the muscles, so the more active fat oxidation begins with the release of energy – it is stored in the form of carbohydrates. After 20-30 minutes of exercise you would be worn out, and the fat will be burned actively. Moreover, there is evidence that fats are burned for about 6 hours even after such sprint workout while muscles are not dried. Despite the fact that jogging is healthy to almost everyone, there is a small list of limitations for running and contraindications to it. Running is impossible if you have injuries and diseases of the spine, heart diseases, acute diseases and varicosis. These conditions might be worsen or you will feel bad. In addition, running is prohibited for pregnant women and sprint is contraindicated for breast-feeding women: extreme exercises release lactic acid from muscles into blood, which can make milk taste unpleasant for the child. It is best to run at the stadium with a special flooring, and if it is not available in a park or forest with dirt tracks. Asphalt is too traumatic for you feet and you will be very tired soon. You should not run along the highways and large enterprises: you will inhale all kinds of chemicals getting headache instead of any good. Do not run on an hour jog or sprint right from the beginning. During the first couple of weeks run gradually increasing the tempo and time of exercise. This way you will prepare your body for stress and will not overtask muscles. Try different methods of running: you will understand what is more convenient for you because not everyone can physically manage sprinting. Choose your comfortable clothes and special shoes for jogging, as the load on the legs and the degree of muscle fatigue depends largely on the convenience of the shoes. When jogging watch your breath: you must breathe through the nose. If you breath through the mouth it dries quickly and you become thirsty. Drinking while running is allowed, but only pure still water or special drinks for exercising. Drink in small sips, as if rinsing your mouth, but do so often. To keep pace, you need the right music and a good mood: forced exercising done in a bad mood would not bring any good results. You would just hate such training and quickly quit it. Run with a smile on your face! ← Previous Story How to recognize HIV and AIDS by symptoms?